President Donald Trump has been accused of insulting Queen Elizabeth II prior to their tea time on Friday. [post_ads]Anti-Trump protestors, who also consider themselves as non-royalists, took their thoughts to Twitter to note that the president made the Queen wait for 10 minutes during their first meeting. They also claimed that Trump shook the Queen’s hand instead of bowing in front of her. At one point, the president also turned his back on the Queen, and he left his suit open. According to USA Today, the president was also late for his tea time with the Queen and Melania Trump. However, Victoria Arbiter, a royal etiquette expert, clarified that this wasn’t the case. “For all those asking, no. 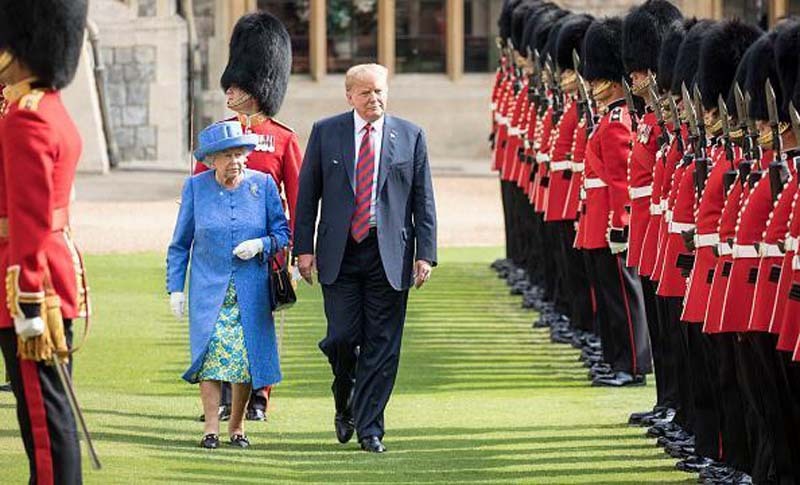 Trump did not keep the Queen waiting. He was due at 5 p.m. and the motorcade drove into the Quadrangle at 4:59 p.m.,” she tweeted. However, this still didn’t stop the Twitter users from pointing out Trump’s mistakes. However, Hugo Vickers, an author, and royal etiquette expert told TIME that Trump isn’t required to bow to Her Majesty. “That wouldn’t be required from a head of state or the wife of a head of state. He would be wise not to attempt to kiss her, and I don’t expect for a moment that he will,” he said.